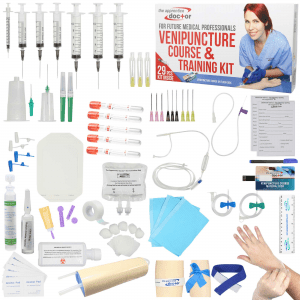 Accredited Phlebotomy Technician Online New Course content, National Exam + Free Training Equipment! Accredited Phlebotomy Technician Certification is offered through PCT, a licensed proprietary school in the state of MI an is accredited by the AMCA, NHA,NCCT and the NAPTP. This course is entirely online for students who are interested in earning their phlebotomy certification. 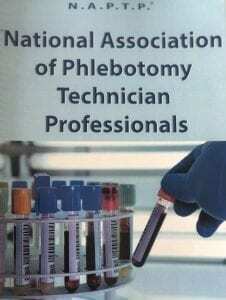 This course also include the national exam through the National Association of Phlebotomy Technician Professionals. This test normally runs $125, however as an added incentive it is now included in our online phlebotomy class, so that our students who live in other states throughout the United States can feel confident that they will be nationally certified upon completion of the course and successful completion of the national exam. The national exam must be proctored in the city where the student lives. The instructor will provide the student with a list of acceptable proctors upon enrollment. The student will be given unlimited 6 month access to the course in its entirety and they will also be provided with their own personal instructor who is a phlebotomist, Family Nurse Practitioner, MSN-FNP-BC and 1st year medical student. The student will have to either provide evidence of 30 successful blood draws. They will be provided with a draw log sheet to record their draws, which must be signed off by a medical professional such as an LPN, Certified Phlebotomist, MD, RN or MA. If the student has previously drawn blood, then their draws have to be less than 6 months old and they must have proof. Student entering the class without draws must locate a lab, physicians office or other location where they will be allowed to complete their draws. Get private lecture videos from medical school student Nancy Kimmel on Phlebotomy, Coagulation, Microbiology, Blood and the hematopoietic system, anatomy, immunology and much more. Lectures such as these would cost students $1000 of dollars. Get the most superior training at affordable pricing. Now Phlebotomy Career Training is offering a payment plan for all online students who wish to purchase a course where they can be proud of their certification nationwide. We realize how important it is for students to have the feel of drawing blood. Which is why, PCT is now including state of the art training equipment for every online phlebotomy student. This will also help prepare students to embark on their externships with confidence. I.V. training is also now included with this course. This course will not last at this current price. The school will assist in placing students in externships for online classes to the extent of preparing a letter of introduction on behalf of the student. There is no job placement offered, however, the student may request a complimentary resume as well as have access to Phlebotomy Career Training’s job board. Phlebotomy Career Training is licensed proprietary school in the state of Michigan and has been in operation since 2009. PCT’s phlebotomy certification is accredited and recognized through the NCCT, NHA, AMCA, and the NAPTP. The national exam must be proctored in the city where the student lives. The student will have to either provide evidence of 30 successful blood draws in addition to 5 capillary draws. If the student has previously drawn blood, then their draws have to be less than 6 months old and they must show evidence of such experience. Professor Kimmel, is a MSN-FNP-BC, 1st year medical student and has compiled all her years of experience as medical professional and a university professor to build courses with a curriculum designed to graduate proficient and competent students in their prospective medical career choice.